Ken joined the team at Synergy in June 2012 and is the Branch Operations Manager. As part of his duties, he is responsible for the compliance and operations functions within the firm, including new account and trade review, branch audits and supervision. 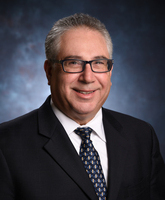 Ken began working in the securities industry in 1983 with the Pittsburgh based brokerage firm of Richards Lynch & Pegher, Inc. and was the Vice President and Operations Manager when the firm completed a merger with Janney Montgomery Scott of Philadelphia. He then migrated into the sales function as a registered representative selling stocks, bonds, mutual funds and insurance products before joining PNC Securities. At PNC, he assumed the duties of compliance officer for the institutional broker dealer and spearheaded the regulatory approval for PNC Brokerage, the retail broker dealer for PNC Corp. In 1994, Ken joined the mutual fund firm of Federated Investors as the Vice President and Director of Compliance. There, he oversaw compliance of the three limited securities broker dealers Federated used to distribute and market their products and services. In September 1998, he joined Mellon Financial Corporation’s capital markets broker dealer, Mellon Financial Markets, LLC, as the Chief Compliance Officer. Ken responsibilities included the duties of Anti-money Laundering Officer, Privacy Officer, and Senior/Compliance Registered Options Principal. In 1996, Ken was promoted to Vice President and Compliance Manager of Testing (Asset Management) for Mellon Financial Corporation (now BNY Mellon Corp). During this time he authored and updated the compliance testing programs for the firm’s affiliated broker dealer database. Prior to joining Synergy, Ken had been the Manager of Fund Compliance at the Bethesda based mutual fund firm, ProFunds, where he oversaw the testing activity of the fund’s service providers in compliance with SEC Rule 38a-1. He has earned the designation as a Certified Securities Compliance Professional (CSCP®), having passed a rigorous examination of broker-dealer and investment adviser compliance best practices, rules and regulations, and industry standards. In 2016, upon the regulatory approval of Synergy Financial Group by the Securities and Exchange Commission as a registered investment advisor, Ken was appointed Chief Compliance Officer. Ken is a graduate of Robert Morris University located in Moon Township, Pennsylvania where he received his Bachelor of Science/Business Administration degree in 1981 with a major in Accounting. He currently holds the Series 7, 63, 24 registrations through LPL Financial. His Series 66 license is held with Synergy Financial Group and LPL. Ken is married to Debbie and they have two daughters, Elisa and Kelcie.